Published: Sep 27, 2015 · Modified: Sep 19, 2018 · By Jen Sobjack · This post may contain affiliate links. Enjoy a soft pumpkin whoopie pie and quickly become hooked. The pumpkin cookie uses canned pumpkin, which results in a soft cakey texture. Brown sugar, molasses, and spices give the cookie a warm fall flavor. The filling is made with cream cheese and cinnamon, along with a few other ingredients, to complement the flavors in the cookie. 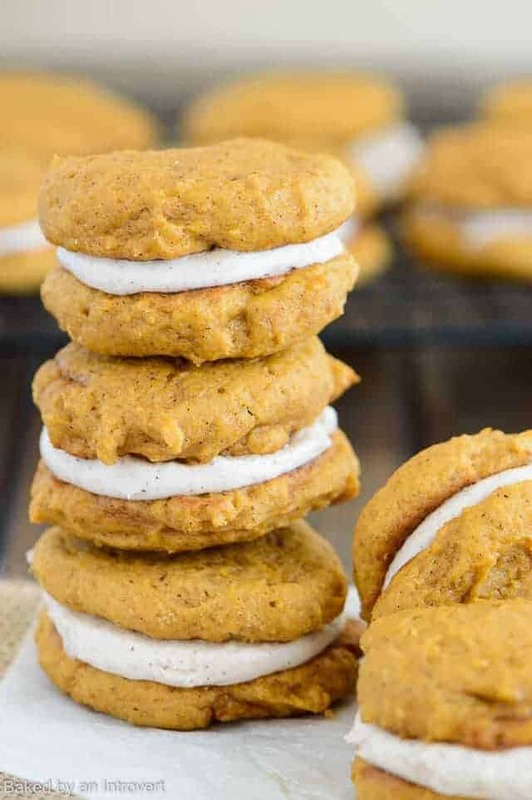 These Pumpkin Whoopie Pies are amazing! The cookies are laced with molasses, cinnamon, cloves, nutmeg, and ginger. These spices give the pumpkin cookies a fragrant aroma similar to that of a pumpkin pie. These cookies are great on their own if you like cakey cookies. They bake up really fluffy with dome-shaped tops. Since I prefer a flatter cookie, I simply smashed them down gently with a spatula after baking. This is totally optional, though. The filling is by far the best part. It’s a mixture of cream cheese, butter, confectioner’s sugar, vanilla paste, and cinnamon. It’s lusciously soft and creamy. I decided to update the photography for this recipe which was originally posted October 2014. As I was remaking the pumpkin whoopie pies, I realized the recipe needed an update as well. I’m working harder than ever to present quality recipes for my readers. I want each and every person who makes something from this site to achieve success. I love getting positive feedback from readers who try my recipes. I also appreciate hearing about your failed attempts. There are many factors which could cause you to end up with different results than I do. Ingredient quality plays a major factor in why some recipes fail. Differences in oven ranges, climate, and improper technique can also play a role in why recipes don’t turn out. When you write me and tell about your experience, it gives me a chance to review the recipe and help you troubleshoot the issue. There are the cases where I need to revise the recipe entirely. While helping you troubleshoot, I may realize there are changes I can make to the recipe that will benefit the next person who tries to make it. That is what I did for these pumpkin whoopie pies. They received a recipe makeover so to say. 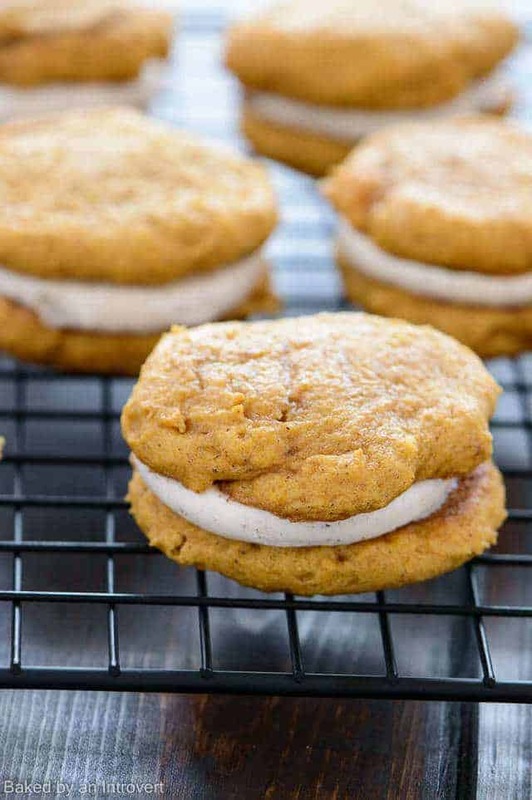 Enjoy a soft pumpkin whoopie pie and quickly become hooked. The pumpkin cookie uses canned pumpkin, which results in a soft cakey texture. Brown sugar, molasses, and spices give the cookie a warm fall flavor. The filling is made with cream cheese and cinnamon, along with a few other ingredients, to complement the flavors in the cookie. 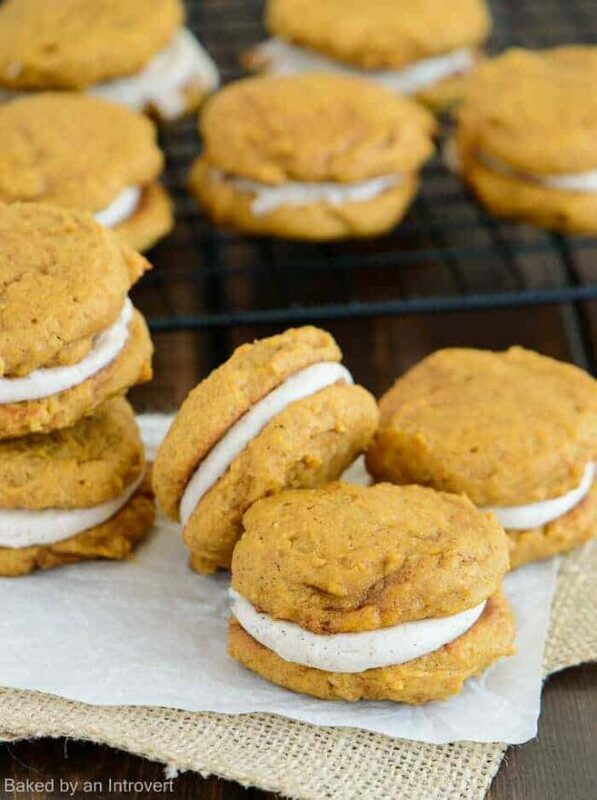 These Pumpkin Whoopie Pies are amazing! Preheat the oven to 375ºF. Line 2 baking sheets with parchment paper or a silicone mat. In a large mixing bowl beat together the butter, oil, sugar, and molasses. Beat in the eggs one at a time, until combined. Stir in the pumpkin puree. In a separate bowl, combine the flour, baking powder, baking soda, salt, cinnamon, ginger, nutmeg, and cloves. Stir with a whisk. Add the flour mixture to the pumpkin mixture, stir just until moistened. Using a 1 tablespoon size cookie scoop, drop mixture 2 inches apart onto the prepared baking sheet. Bake for 16 to 18 minutes, until the cookies feel firm. Cool cookies on the pan for 5 minutes before transferring to a wire rack to cool completely. Make the filling: Beat together the cream cheese and butter until fluffy. Slowly beat in the confectioner's sugar until smooth. Add the vanilla and cinnamon. Beat until blended. Spread the filling onto the bottom of one cookie. Top with a second cookie. It sounds like your oven runs hot. I suggest you invest in an oven thermometer. What a great sweet snack for a party and no mess afterwards! What a great fall cookie! I really like that there is molasses in these cookies! Jen these are just beautiful and perfect!! I don’t mind getting feedback from readers about a recipe, unless they didn’t do the recipe EXACTLY as I wrote it. Then I’m kind of like, “Okay, so you used this instead of that and now you’re wondering why it didn’t work?” But otherwise, yep. Altitude, oven fussiness, ingredients, everything. So much margin for error! These look great. 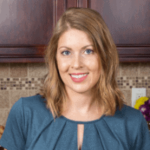 I want to redo photos on SO many of my recipes! These are the perfect fall treat!! Love all the helpful tips! I am obsessed with pumpkin and love a whoopie pie. They look amazing!! I’m a fairly new convert to whoopie pies, but now I love them. And I LOVE this fall version! Love the photos! This is one of my favorite fall treats. My sister traditionally makes them for the day before Thanksgiving. As we’re getting ready for the ‘big show’ – we’ll usually have taco soup and these cookies to help us get through all the cooking! Yours look divine, my friend! I love that you used molasses in these Jen! They look perfect! Oh my gosh, these look so perfectly soft and that filling looks delicious! I LOVE whoopie pies, these look fantastic! Love the idea of pumpkin flavoured ones! I love pumpkin whoopie pies! And cream cheese frosting? Yes please! I love the addition of the molasses! Great update! These are so perfect for September! I’ve been going through my old recipes and rephotographing them too — it makes such a huge difference! Gorgeous! Isn’t it fun to go back and rephotograph them? I’ve been learning so much about photography and reshooting old recipes gives me a ton of practice. Jen, I love whoopie pies!!! and love how you made these perfect for fall!! Gahhhh that filling is seriously killing me! And all that extra-soft pumpkin goodness! I think it’s safe to say I need these whoopie pies in my life asap! So gorgeous, Jen! Thank you for the kind words, Sarah! Thank you so much, Blair. You’re so sweet! I missed these last year, but they look perfect! Pinned to try them! You weren’t missing much at the time. I’m so glad I had the chance to update them. Thanks for pinning! These look so soft and delicious! That frosting looks amazing…I bet these taste so good!! Thank you Rachel! They were absolutely delicious. Oh my gosh, Jen! These whoopie pies are just perfect. I am seriously in love with all that fluffy frosting and how freaking huge these look. Get in mah belly! 😉 Pinned. They are huge, aren’t they? I was afraid they were too big. Go big or go home, right? Thanks for the pin, Sarah! Wish I had a couple of these pumpkin whoopie pies to devour right now, they look SO delicious – especially with all that incredible cream cheese filling! I know you would enjoy them, Thalia! They were the best pumpkin cream cookies I’ve ever made. I love how thick, soft and moist these look Jen! Pinning! Oh boy, I would totally eat more than one! I love how soft and dreamy they look and that cinnamon cream cheese frosting sounds heavenly! Yum! These look delicious, I love the cinnamon spiced cream cheese frosting, such a perfect compliment to the pumpkin cookies! Thanks, Stacey. The frosting certainly was wonderful pair with the pumpkin cookie. Your husband definitely has good taste, Jen! I love that you decided to make your own whoopie pies! I like the store-bought ones, but this homemade version sounds a million times better. And the fall flavors and sweetened cream cheese sound like the perfect combination for these cuties! Love this, Jen! Pinned! Haha! He certainly does, Gayle. I agree, the homemade ones are far less sweet and made with much more love. 😉 Thanks for pinning. Boy, oh boy! I am loving the thickness on those cookies! Whoopie pies are the best because it’s a great cookie to frosting ratio! YUM! I wanted a a thicker cookie, unlike most whoopie pies which are teeny. I guess I should have called these “Monster Whoopies”. Still totally delicious though. So tiny, so perfect, all that frosting is calling my name. Thanks, Catalina! They turned out so good. I think I ate far more than I should have. these look yummmy! they look so light yet moist! perfection! A hot latte would definitely go nicely on the side. Thank you for reading.